Welcome to Spectator Mode, a new feature on Kotaku where we give you a look at some of our favourite PC games that you may never have heard of. 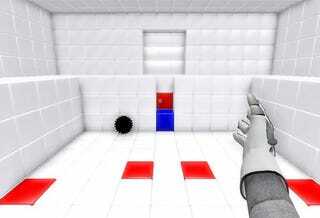 Kicking things off is QUBE, a small, short puzzle game built on the Unreal Engine 3.0. It falls somewhere between Portal homage and complete Portal rip-off, but its clean graphics and block-shifting puzzle mechanics still make for an entertaining run. You can grab it here (it's around 180MB). QUBE is completely and utterly free.